Marshal Humberto de Alencar Castelo Branco (Portuguese pronunciation: [ũ'bɛʁtu dʒi alẽ'kaʁ kas'tɛlu 'bɾɐ̃ku]) (20 September 1897 – 18 July 1967) was a Brazilian military leader and politician. He served as the first President of the Brazilian military government after the 1964 military coup d'etat. 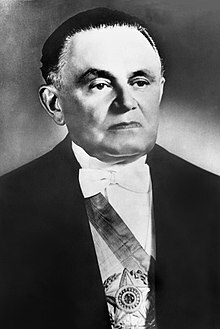 Castelo Branco was killed in an aircraft collision in July 1967, soon after the end of his Presidency. Castelo Branco was born in a wealthy Northeastern Brazilian family. His father, Cândido Borges Castelo Branco, was a general. His mother, Antonieta Alencar Castelo Branco, came from a family of intellectuals (which included the writer José de Alencar). He was married to Argentina Vianna, and had two children, Nieta and Paulo. ↑ Dulles, John W. F. (1978). Castelo Branco: The Making of a Brazilian President. College Station, TX: Texas A&M University Press. ISBN 978-0-89096-043-1. This page was last changed on 4 April 2019, at 13:02.